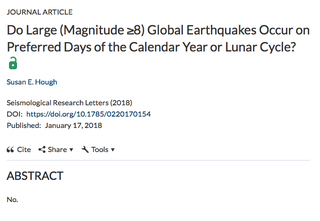 So she analysed the global earthquake catalogue from the 1600s until now, recording the day and lunar phase of large magnitude quakes to see whether there were clusters of earthquakes around certain dates or phases. There weren’t. Hough’s abstract isn't the first to be a one-liner, and won't be the last. There’s been one regarding faster-than-light neutrinos (which don’t exist, as far as we can tell), a completely empty abstract for a 1974 paper on writer’s block, and Gardner and Knopoff’s 1974 paper I cited earlier. Lots of people are talking about these papers now on social media.